Pink-spotted Hawkmoths (Agrius cingulata, formerly A. cingulatus) are found in the southwestern U.S., Mexico, Central America, and throughout much of South America. However, Pink-spotted Hawkmoths are very strong fliers, and strays can be found great distances from their normal range. I captured this Pink-spotted Hawkmoth below inside my Tucson, Arizona house one evening in October of 2007. After posing nicely for some photographs, it was released back out into the night. Pink-spotted Hawkmoths are large, plump-bodied moths with an up to 4 3/4 inch (12 cm) wingspan, and they can be identified by the alternating black and bright pink bands on the sides of their abdomen. 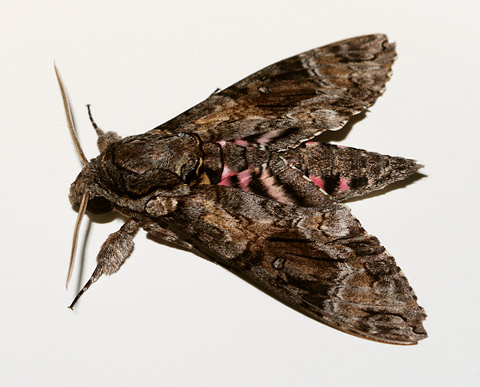 Pink-spotted Hawkmoths have furry legs, mottled brown and gray forewings, black-banded hindwings with bright pink at the base, and large, dark eyes. With their unusually large eyes, the nocturnal Pink-spotted Hawkmoths are easily able to find and visit nectar-filled, night-blooming flowers. Moth-pollinated flowers are usually white so that they can better be seen at night, fragrant to attract moths by scent, and tubular in shape to hold the sweet nectar supply. A number of Sweet Four O'Clocks (Mirabilis longiflora) were blooming in my yard during that October when I found the Pink-spotted Hawkmoth. The Sweet Four O'Clock plants later produced a good crop of seeds, so some night creature, perhaps it was the Pink-spotted Hawkmoth, managed to pollinate these night-blooming flowers despite their amazingly long floral tubes. 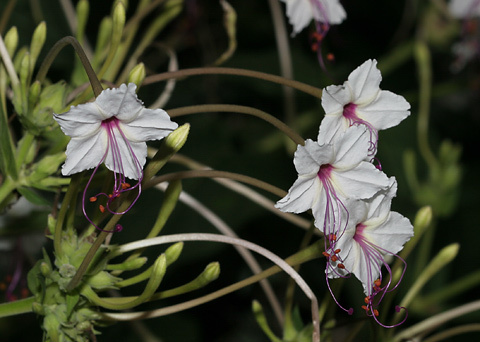 Sweet Four O'Clocks are sweetly fragrant and have all of the characteristics of a moth-pollinated flower, but it would take a large moth like a Hawkmoth or a Sphinx Moth (Family Sphingidae) to pollinate them. Both the nectar-feeding adult Pink-spotted Hawkmoths and their leaf-munching caterpillars are attracted to plants in the Morning-glory Family (Convolvulaceae), especially fragrant, night-blooming, white Moonflowers (Ipomoea alba). The caterpillars will also feed on some plants in the Potato Family (Solanaceae) like Jimsonweed (Datura spp.) despite their toxicity.